Shortly after debuting in purely petrol form, Honda has added a frugal CR-V Hybrid to its flagship SUV range. Why's that? With no diesels (there won't be any coming later, either), Honda is pursuing alternatives, with this new petrol-electric model claiming up to 53.3mpg - the most impressive economy claims across the whole CR-V range. How does the Honda CR-V Hybrid gubbins work? The i-MMD (Intelligent Multi-Mode Drive) powertrain makes use of a 2.0-litre four-cylinder petrol engine and two electric motors producing a total system output of 181bhp and 232lb ft of torque, that latter figure making it the punchiest motor available in the CR-V range. An enticing combination as the pokiest and most economical of the bunch, with a 0-62mph time of 8.8 seconds for the FWD model, and 9.2 seconds for the AWD. You can spec your Hybrid in either configuration. The hybrid system automatically juggles its way between three modes - EV, Hybrid and Engine Drive. In EV Drive the battery sends power to the electric propulsion motor directly, enabling up to 1.2 miles of pure EV driving around town. In Hybrid Drive, the petrol engine powers one of the two electric motors - the generator - which then sends power to the propulsion motor. In Engine Drive, the engine sends power to the wheels directly via a lock-up clutch. There's no CVT transmission here - just a fixed-gear set-up. You can also select an Econ mode to boost efficiency, while a Sport button is there for nippier manoeuvres if you feel so inclined. Is the petrol-electric CR-V any good? It is. The hybrid system may sound complicated with its fixed-gear transmission and its many driving modes, but in reality the car just sorts itself out and lets you get on with driving. And the way in which it switches between driving modes based on the way you drive it is seamless. When pootling around town you'll find yourself in EV mode more than you might think, meaning you can coast around in silence. This has benefits in that it's incredibly quiet and eco-friendly in urban areas, but you may also find yourself surprising a few pedestrians in built-up areas. When the engine does fire into life to send charge to the battery, it does so very quietly. 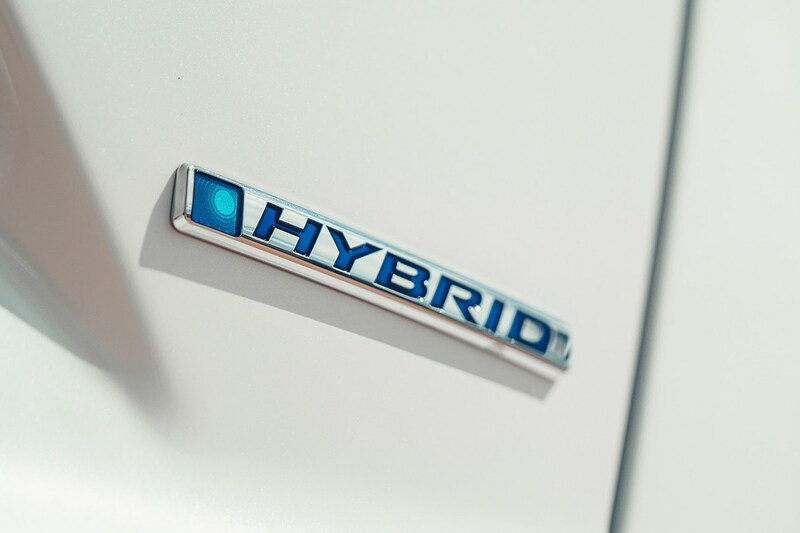 You'll find yourself in Hybrid Drive most of the time - be it in town or on faster roads away from urban areas, where the engine and electric motors are working together. But unlike many hybrid cars with CVT transmissions, the CR-V's set-up affords it a very hushed driving experience. Floor the throttle and there's a short wait while the powertrain seems to slowly build itself up to surge forwards, but it does so incredibly smoothly, and in a much quieter fashion than the petrol CR-V with a CVT. This is easily the most refined version. But you won't be wanting to drive like that all the time - it's not the reason you buy a hybrid car, and it's probably not what you'll be doing in a sensible family SUV. The only time you will find yourself doing this is getting up to speed on the motorway. It's not an overly thrilling car to drive on other roads, but it's not designed to be, however it does remain surprisingly agile in corners with nicely weighted steering and good body control. Plus it boasts a spacious and well laid-out cabin that's easy to operate. 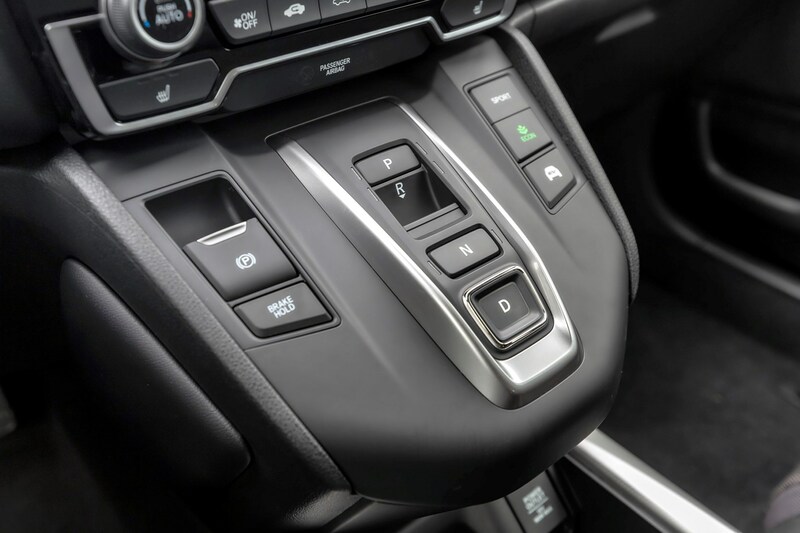 There's even a bit of a nod to the NSX (also a hybrid), with similar buttons on the centre console in place of a traditional gear selector to flick between Drive, Reverse, Neutral and Park. 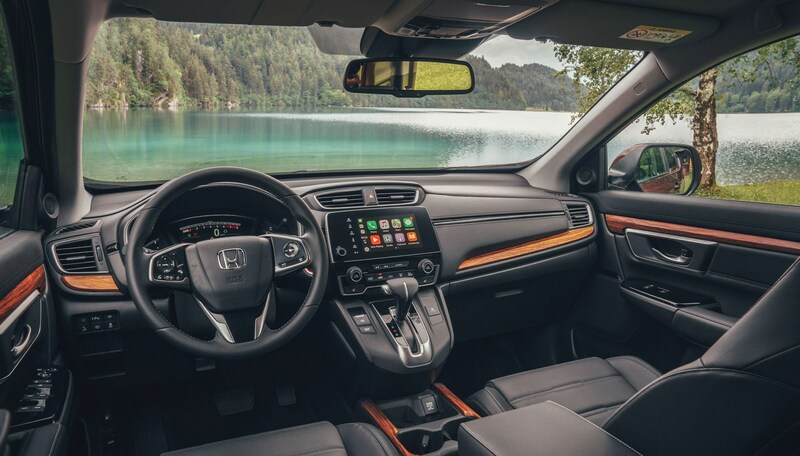 The only thing you might not be able to operate that easily is the infotainment system - controlled via an old and slow touchscreen with aging graphics. Our solution? Connect your smartphone via Apple CarPlay ot Android Auto if you can. Otherwise, you'll have to make do. The CR-V Hybrid is also more expensive than equivalent petrol models, but the jump isn't huge on higher-spec models (about £800 extra at the top of the range), and for that you gain extra refinement and better fuel economy). Finally, the boot is a little smaller as the battery pack takes up some of the space, but at 497 litres it's still a generous load area that's easy to access and easy to expand by folding the rear seats down. You also don't get the option of having this version in seven-seat form. Otherwise, it's business as usual. 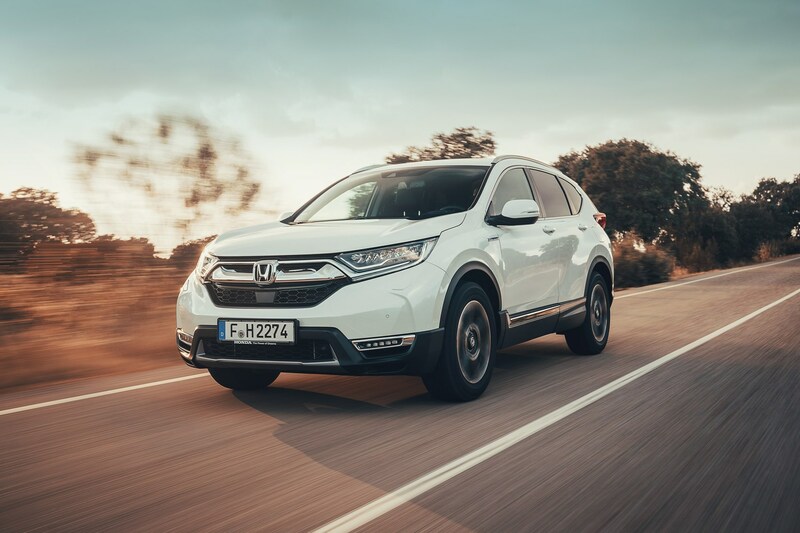 Read on for our full review of the rest of the Honda CR-V range. The Honda CR-V is not an exciting car. But it is an important one, both for the company that makes it and for the SUV market around the world. This is one of the globe’s best-selling mid-sized SUVs, particularly in the USA where it’s sat at the top of charts for a number of years (slipping to no. 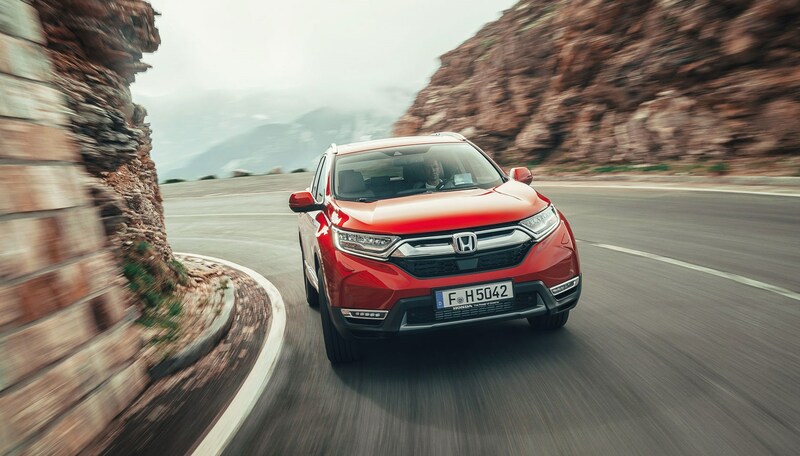 3 last year) but also on this side of the Atlantic; nearly a quarter of Honda’s total car sales in Europe are CR-Vs at the time of writing. So, while this new, fourth-generation CR-V (replacing the third-gen car launched in 2007) has some nice comfy laurels to rest on, it’s also a car that Honda really does need to be a success. No, this is the new CR-V. While the nose and tail are very much evolution rather than revolution on the design front (albeit with an extra-generous helping of chrome this time around), they bookend a new car with a new, stronger bodyshell and rejigged proportions compared with its predecessor. The A-pillars have shifted backwards, ostensibly to make the bonnet look more powerful, but also to boost visibility from the driver’s seat. The most important packaging change, however, is a longer wheelbase. The new CR-V is not any longer overall than its predecessor (although it is a little wider), but the extra space between the axles has freed up a huge amount of interior space. Sit in the back, even behind a tall driver, and there’s a huge amount of leg room. That’s come partly from the wheelbase (30mm extra knee-waggling space) and partly from the seats (now 20mm thinner, but actually more comfortable than before, and with a greater range of lumbar support). On the downside, the bodywork’s panel gaps are also spacious, particularly around the tailgate, where one side was wider than the other on a car we tested. 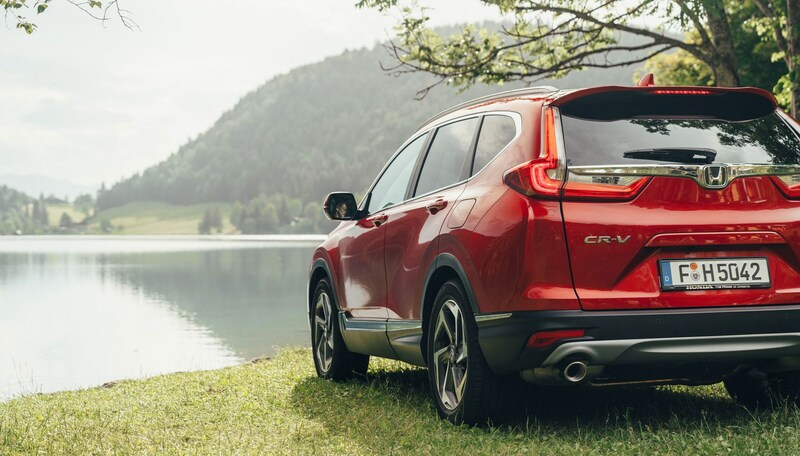 The CR-V’s architecture is closely related to that of the current Civic, and features a similar suspension setup with MacPherson struts up front and a multi-link rear. While the previous two CR-V generations were built in Honda’s Swindon factory in England, the new car is built in Japan, allowing the Swindon plant to concentrate on manufacturing the Civic family (including the Type R). Both this time. A seven-seater option has been introduced due to demand. Five-seater models are still expected to be the biggest sellers in the UK. Seven-seat versions are all-wheel-drive only, and hybrid versions are five-seat only, to make space for the battery. Four trim levels in the UK: S, SE, SR, and range-topping EX. The latter will include goodies such as a head-up display and heated steering wheel. One engine was available from launch: a 1.5-litre petrol, as seen in the Civic but with a different turbocharger and ancillaries. Two gearboxes are on the menu, a six-speed manual or a CVT auto. The latter is only available in all-wheel-drive cars, while manual versions get a choice of front- or all-wheel drive. Honda expects the manual, AWD, SE version to be the biggest seller. 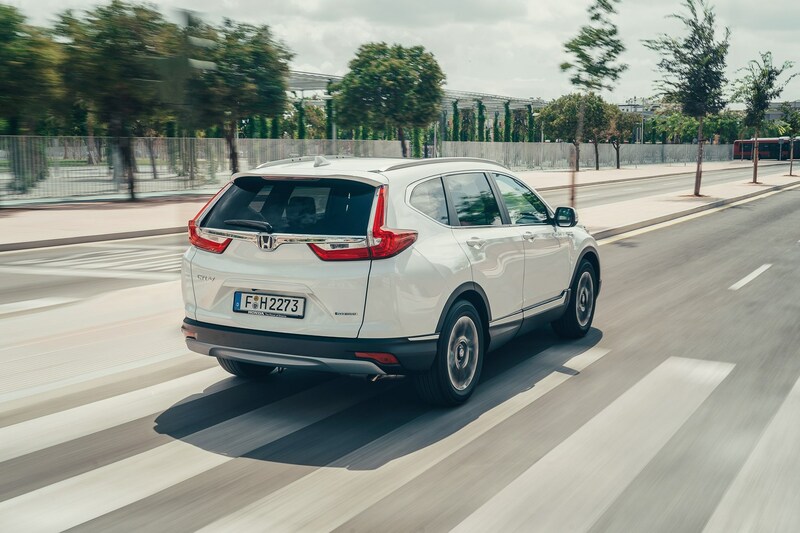 The AWD system is the same as that of the previous CR-V, but Honda has changed and optimised the control logic, so it can now send more torque to the rear when required. It can also apportion some of the torque from side-to-side, to help keep the CR-V on target mid-corner. Honda has confirmed there will be no diesels for the CR-V this time around. A petrol-electric hybrid version takes the place of the diesel, expected to sell strongly in top-spec AWD EX form. An interesting arrangement, it includes two electric motors but no gearbox, with electronically controlled clutchpacks between motor and engine. It’s a set-up that will be rolled out across more Hondas in the future. What’s it like to sit in? Apart from gigantically roomy, nondescript yet pleasant – which sums up the whole car, really. Like-’em-or-loathe-’em wooden trim inserts are standard. Honda UK is considering adding some alternative finishes as options, and we tested the Hybrid with some much more flattering aluminium-look items. The fake stitching moulded into the soft dashboard plastic may polarise opinion too. The door pockets are enormous, helped by the speakers having been moved upwards in the compared with the previous CR-V. Rear passengers can benefit from heated seats and their own USB sockets, and in the most luxe-spec trims the driver gets a head-up display, heated steering wheel and Apple/Android phone compatibility. Many of the surfaces are soft-touch but feel reassuringly sturdy, and overall quality is strong. The touchscreen is a similar setup to the current-generation Civic (although thankfully the CR-V gets a proper volume control), and it’s similarly frustrating and unintuitive to navigate. What’s the new Honda CR-V like to drive? This is a big car, at the larger end of the medium-sized SUV market, but it handles very tidily. It’s not exciting, but it’s a safe, well-set-up passenger car, with faithful responses. The new CR-V has already been on sale in the States for nearly a year, and this Euro-spec car steers, rides and handles better than a US CR-V we’ve also driven on an adventure road trip in Colorado (in CAR magazine’s September 2018 issue). The variable-rate steering becomes quicker with more lock, and feels natural in operation. Manual cars have a snappy shift operation more akin to a hot hatch than an SUV, and the CVT works fairly well around town. It struggles more on the open road, however. Hills are not its friend. The European-spec car we tested in Austria felt like the CVT was far better calibrated than the one we tried in the USA, however, which was laggy in the extreme. This one spent less time hunting less for the right ratio at the right moment. Road clearance has been increased by 35mm compared with the previous CR-V for a 201mm total. That should mean more body roll, but the European car gets some trick dampers that USA cars miss out on, with separate openings within to control the flow of oil to deal with smaller bumps and body roll separately. They work well, combining decent body control with an extremely supple ride. Sound deadening has been improved too, and the CR-V is notably quiet and well-insulated at a cruise. Performance from the 1.5-litre petrol is best described as ample. It’s certainly not a quick car, but nor is it embarrassingly slow. Why a year gap between the USA and European launch? ‘The USA market is very predictable – one country, one culture, not demanding of vehicle performance. Europe is very different; lots of countries, road and climate conditions, more severe customer expectations. The new Honda CR-V is not an exciting car, by any means. But it is a good one. It quietly gets on with the job, and does it very well. The five-seat version feels like it makes more sense than the seven-seater, its larger, more accessible cargo bay making it the more practical choice overall. The CVT gearbox is effective around town, but the manual is the better choice if you live somewhere hilly, or like driving briskly. Prices at launch start at around £26k, extending past £36k for generously specced 4WD auto versions, but the CR-V is, both physically and practically, a lot of car for the money.